← Homocysteine Levels – Do You Care? A diagnosis of prediabetes is a wakeup call that no one should ignore. It means that one can no longer continue to eat poorly, neglect physical activity and give up on weight loss when needed. If lifestyle habits aren’t improved, prediabetes means there is a high risk for development of type 2 diabetes within ten years of diagnosis. With prediabetes blood glucose and insulin levels are higher than what is considered normal, but not yet high enough to be considered diabetes. For those who wish to stop prediabetes in its tracks, there is good news. Prediabetes can be reversed and diabetes type 2 can often be prevented just by improving and maintaining a healthier lifestyle. As having prediabetes not only increases the risk of diabetes but other serious health conditions as well, reversing prediabetes is one of the best prescriptions for improving and supporting long term heath. Statistics show that as many as 25% of Americans have prediabetes and may not be aware of what that means. Per the National Institutes of Health, prediabetes is a high-risk state for diabetes characterized by high blood sugar and a metabolic disorder known as insulin resistance. Studies show the associations between prediabetes and early forms of chronic kidney disease, diabetic retinopathy, and increased risk of macrovascular disease. Statistics show that 5 – 10% of people per year with prediabetes will progress to diabetes with the same proportion converting back to normal levels. With lifestyle modifications, there is evidence of a 40 – 70% relative risk reduction. According to the American Diabetes Association (ADA), those with prediabetes can lower their risk of type 2 diabetes as much as 58%, simply by losing at least 7% of their body weight and exercising moderately. Brisk walking 30 minutes a day, five days a week and the loss of loss of 10 -15 pounds can make a huge difference in glucose levels. Don’t be fooled into thinking that prediabetes is a separate illness from type 2 diabetes. Ralph DeFronso, M.D. Chief of the Diabetes Division at the University of Texas Health Science Center states, “The development of type 2 is a gradual process that occurs over years. 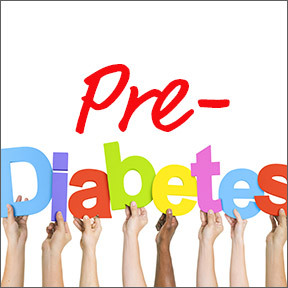 People with prediabetes, in my opinion, have diabetes, they just don’t meet the cutoff points set by the ADA yet.” DeFronso argues that people with prediabetes should be treated early and aggressively. Although he believes that initially diet and exercise are the best way to treat prediabetes, he thinks most people fail to lose any weight or stick to an exercise program. In those cases, he finds that pharmaceutical intervention will protect people from microvascular complications such as eye, kidney and nerve problems later. Follow a Mediterranean style diet that includes fatty fish, vegetables, fruits and high fiber grains, and excludes added sugar and processed foods. The goal should be to control the glucose level to keep it in a healthy normal range. Incorporate 30 minutes of physical activity in their daily schedule by walking or riding a bike instead of driving whenever possible, working out at a gym or participating in recreational sports. Exercise lowers the blood glucose levels and improves insulin resistance. Lose weight if needed. A quality diet combined with exercise will help with weight loss and the maintenance of that new healthier weight. Nanogluco Control by BioPharma Scientific – This clinically proven, highly absorbable formula is designed to naturally support glucose metabolism and insulin sensitivity with no side effects. Non-GMO formulation. Glucose Control Formula by Complementary Prescriptions – This synergistic vitamin and herbal formula is designed to be used along with a balanced diet to support healthy blood sugar levels. Ingredients include N-acetyl-cysteine, the bioavailable form of cysteine along with standardized herbal extracts that help maintain metabolic balance. Gly-Control™ by Progressive Labs – This targeted formula provides a blend of nutrients designed to support normal range blood sugar levels. Glycation Manager™ by Integrative Therapeutics – This exclusive combination proprietary formula is designed to help promote optimal blood lipids, healthy blood glucose and proper protein metabolism. Specific ingredients support healthy metabolic function, circulatory health and tissue function. Gluten, dairy and sugar free, vegetarian formulation. This entry was posted in Home and tagged Diagnosis: Prediabetes, Professional Supplement Center, Vitamins and supplements, www.professionalsupplementcenter.com. Bookmark the permalink.